Robot & Frank Blu-ray Review The film merely provides light entertainment but it does it sufficiently well. Frank (Frank Langella) is a stubborn old man who lives in an anonymous town. He was formerly a professional thief and served prison time for stealing high-end jewellery. His skills were so notorious that his exploits were even referenced in police academies. Now in the twilight of his life, his once agile mind has lapsed into a demented state and his only excitement derives from pleasant flirtations with his local librarian, Jennifer (Susan Sarandon). His attorney son, Hunter (James Marsden), pays him weekly visits and he keeps in contact with his itinerant daughter, Madison (Liv Tyler), but only intermittently. Resentful of his father’s ungrateful detachment, Hunter decides to cease his visits and leave Frank with a robotic helper (voiced by Peter Sarsgaard). It engages in conversations, performs all household duties and helps Frank lead a healthy life. Frank is initially hostile towards the idea but swallows his pride after Hunter threatens to put him in a nursing home should he refuse. Meanwhile, a progressive developer named Jake (Jeremy Strong) implements plans to reform the local library, beginning with the digitalisation of the library’s collection. One day, Frank fortuitously discovers that the robot cannot factor in state and federal laws, and can thus help him commit robberies. He subsequently embarks on a mission to steal Jennifer’s favourite book, a rare edition of Don Quixote, from the library before it is digitalised, with the robot’s assistance. Frank’s reversion to thievery leads to many unexpected emotions and surprises. 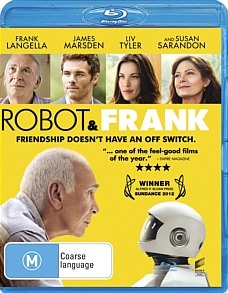 Robot & Frank is a droll, low-key film that offers emotional rewards in incremental doses, culminating in a heartfelt conclusion that catches the audience off-guard. The obvious source of this emotion is the relationship that blossoms between Frank and his “health care aide”. At face value, they seem as incongruous a pair as Harold Chasen and Maude Chardin. However, like them, their relationship turns out to be rather harmonious. Their exchanges are often dry-humoured and though one may be forgiven for not laughing at them, they do create a wonderful flow to the story. The laughs feel as if they are gently and not forcibly manipulated into existence. Langella’s acting is sublimely subtle as he portrays an unlikeable character whose contempt towards his arid existence is palpable in all that he does. That said, the same restraint that helps the story flow also curtails its overall impact dramatically. Schreier’s treatment of Frank’s life is so unsentimental that it becomes difficult not to feel detached towards most of Frank’s story. His amorphous characterisation of Frank results in Frank’s underlying relevance as a protagonist, apart from his faint illumination of modernity’s absurdities (which was done much more masterfully in Jacques Tati’s Playtime), being completely lost on the audience. The story is narrow in scope and esoteric in its content with no clear insight into humanity shaping the story. The viewer is left with an empty last impression. The film merely provides light entertainment but it does it sufficiently well.